Monroe College is committed to helping you jumpstart your college education by offering interesting and challenging courses. Monroe offers a variety of Bachelor and Associates Degrees. As a teaching-oriented institution of higher learning, Monroe emphasizes instructional excellence, and is committed to sustaining faculty who are caring, dedicated and knowledgeable in their fields. Jumpstart classes are offered in both the fall and winter semesters. Registration takes place in September for the fall semester and January for the winter semester. Class offerings may be adjusted based on the level of interest each semester. 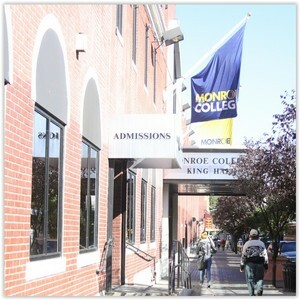 Monroe College was founded in 1933 and is a private, coeducational institution accredited by the Middle States Commission on Higher Education. Jumpstart classes are offered free of charge to qualified candidates – a value of over $1,700 per 3-credit course. Students could be eligible for scholarships and grants upon acceptance and commitment to Monroe College. Classes are taught by experienced Monroe College faculty. Monroe College grants three college credits for each class successfully completed. Classes run once per week during the fall and winter semesters. Students must adhere to the college attendance policy and complete required exams and assignments to earn a grade and be awarded college credit. Once credits have been awarded, Monroe College provides official transcripts by request.